Some of these blog features are months in the making. Madison and I have been in touch since the spring. And in the past six months, I’ve watched her go from a van to a truck, as well as fine-tune her jewelry-making setup and process. Madison’s business, Vancrafted Studio is inspired, designed and created in nature. Her handmade jewelry ranges from rings to necklaces to earrings to bracelets. Every piece is one of a kind and made from the love and struggle of the open road. After graduating from Northern Michigan University School of Art and Design, I moved into a Chevy Express van with the quest to live a more minimalist, alternative lifestyle. During the first year, my fiancé Gage and our Australian Shepherd, Tobin, traveled from coast to coast and back again. During that time, I began to hammer out a jewelry studio on wheels. Gage built me a removal jewelry bench in the van that gave me the opportunity to work anywhere and everywhere. A cooler doubled as a chair and tools of all kinds began to line the walls of our van. By working without the conveniences of a modern jewelry studio, my pieces were harder earned and even more rewarding when they came to completion. Overcoming the limitations of working on the road has made me the jeweler I am today. 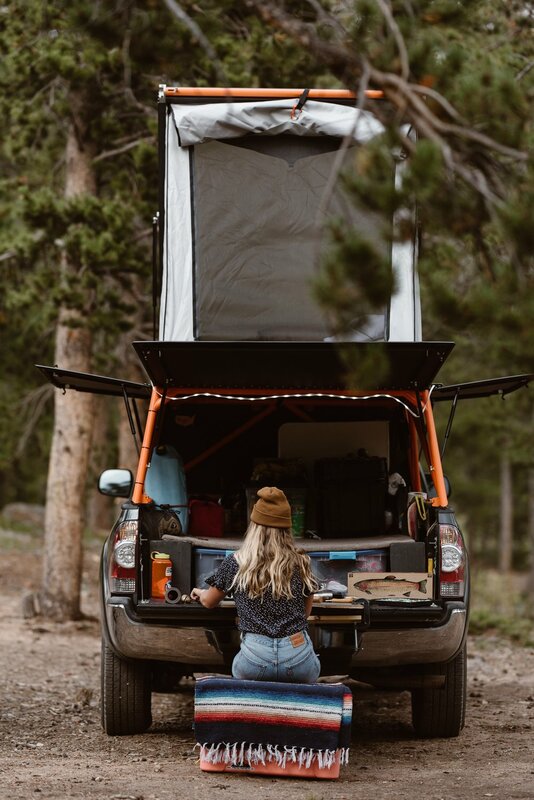 With a couple thousand miles and after few years in the van, we came to the realization that although we loved our gas-guzzling, big white van, it wasn't necessarily the most functional adventure mobile. For one, it allowed us to bring unnecessary things with us like extra clothing, decorations, knick-knacks and books. And those things took away from our minimalist lifestyle. We were also faced with the risky decision to venture down those bumpy, dirt roads to get places, which could result in getting stuck in the middle of nowhere. With the desire to no longer be limited to safe, maintained paths, we made the tough call to trade in our first home together and downsize to a Toyota Tacoma. Today, Vancrafted Studio is operating out of that truck and we haven't looked back. Now, I can confidently say we have the perfect adventure mobile for us and most functional jewelry setup yet. We have a Go Fast Camper on top to provide a place to sleep and hang out when the weather is bad. Panels open up on each side of it to provide sun cover and a breeze. When we drive, we close them so that no dust or dirt comes into our precious home and gets on our things. When it's time to work, I c-clamp the bench pin to the bed of our truck and set up shop. I carefully planned and purchased materials that would set me up for success in my mobile studio. All of my tools fit perfectly into a rolling toolbox I purchased from Home Depot. I opted for a portable torch that uses little oxygen and propane tanks that I can source at hardware stores across America, so that I will never run out of fuel. We have a Goal Zero 400 solar setup that has just enough juice to charge up my camera and rotary tools. We carefully check the wattage to make sure it can sustain everything that we need. Although there have been many upgrades along the way, one thing that has remained the same is that the cooler is still my chair. One thing I struggle with is being conscious of is the balance of work and adventure. I'm a creative person and my experiences on the road tend to build up ideas that I constantly want to translate to metal. I find myself wanting to make jewelry more often than not. Sometimes the weather makes the decision for me if its too windy or rainy to metalsmith. And sometimes I have to convince myself on a beautiful day to put my tools down and go for a hike with Gage and Tobin. I remind myself daily of the reasons why we live this way. If you're yearning to get a handmade, Vancrafted piece of your own, you have a chance each month. I work on a body of work and usually name it after the surroundings I've been the most inspired by during that time. I will set an exact date and time that I will be releasing the collection, so you can plan accordingly and log into Vancraftedstudio.com to scoop up the piece that you've been eyeing. Leading up to the release date, I preview the pieces that will be available on my Instagram account @vancraftedstudio. Photos courtesy of Madison Hampton & Amber Sovorsky.